A-HOTEL.com - Luxury and cheap accommodation in Sreznevo, Russia. 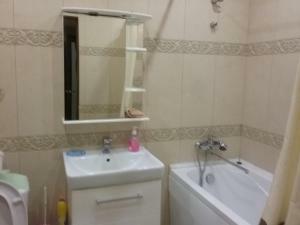 Prices and hotel, apartment booking in Sreznevo and surrounding. Offering 2 saunas with a plunge pool, Motel Vysokoe is located in on M5 Highway, 20 km from Ryazan. Free WiFi access is available. Located in a quite picturesque area of Alpatyevo, a 5-minute walk to the bank of the Oka River, Alpatievo Hotel feature a spa centre with a sauna and massage. The comfortable rooms come with shared or private bathroom facilities. Located in Lukhovitsy, Aviafierma "Iasnyie zori" features accommodation with free WiFi and flat-screen TV. Some units also have a kitchenette equipped with a microwave. Providing free WiFi, Baden baden is set in Ryazan, within 5 km of Victoria Plaza. The property is located 8 km from CSK Stadium. Park Hotel Sova offers accommodation in Ryazan. Free private parking is available on site. Situated in Ryazan, just 3.2 km from Victoria Plaza, Apartment Smart on Moskovskom features accommodation with free WiFi. Boasting accommodation with a balcony, Apartment on Vishnevaya is located in Ryazan. The apartment is 3. Set 2.6 km from Victoria Plaza in Ryazan, this apartment features a balcony with city views. 3 km from Victoria Plaza, Sleep House Рязань is situated in Ryazan and features free WiFi and express check-in and check-out. Offering a shared lounge, the property is located within 5 km of CSK Stadium. Апартаменты на Мервинской is situated in Ryazan, 3.7 km from Victoria Plaza and 6 km from CSK Stadium, in an area where hiking can be enjoyed. Located in Ryazan in the Ryazan region, Аппартаменты на Мервинской Ряз. Has a balcony and city views. Apartment on ulitsa Moskovskaya 8 offers accommodation in Ryazan, 1.6 km from Victoria Plaza and 4 km from CSK Stadium. апартаменты на Михайловском шоссе offers accommodation in Ryazan, 1.6 km from Victoria Plaza. ATRON-HOTEL is located in Sekiotovo, 11 km from Ryazan city centre. Guests can enjoy the on-site restaurant. Hostel 24 is located in Ryazan, just a 5-minute walk from Ryazan-1 Train Station and Pobedy Square. Free WiFi access is available.